Thanks to your emails, comments and questions, we realize and understand that our communications have been limited with gaps that were time-frame bound. There are reasons for this situation. Now is our chance to address this; we hear you. 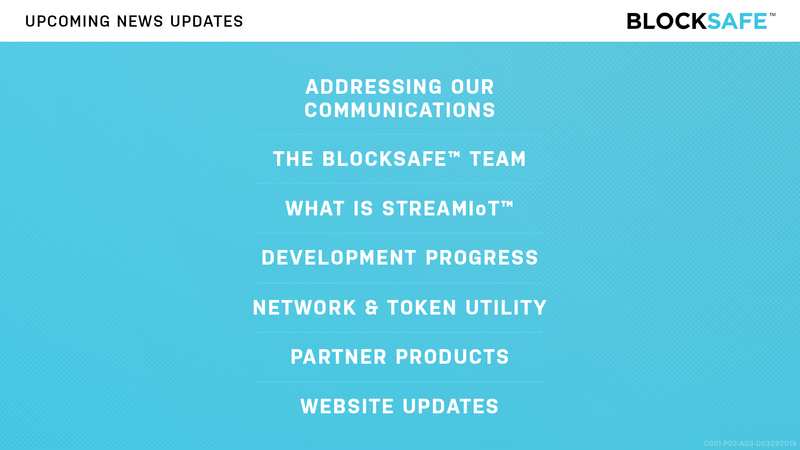 Going forward, where legally allowed, we will have more frequent updates, more detailed information and be more available to the community to address your questions. This is our commitment to you. Previously we were very active on social media due to Kevin Barnes (Founder, and now Chairman) building Blocksafe® from the ground up. He was very active on social media to prove that there was interest in his idea and vision. His personality attracted attention and the community responded, they showed interest in his ideas and so he persisted. He pushed forward and was able to create the Blocksafe® project and team. As the team grew he recognized the strengths of each member, primarily Duane Jacobsen and his product-focused background. Recognizing Duane’s potential, Kevin asked Duane to take on the role of CEO. Kevin will continue to pioneer and guide the vision of Blocksafe® and its future as the Founder and Chairman. Kevin is still the architect who designed the plans; Duane is leading the construction team. Duane has 35 years of experience developing disruptive and award-winning fintech platforms, products and services. His background includes a 10-year tenure at American Express as Vice President, where his work resulted in several patents in the US, Canada and internationally. Duane is also the co-inventor of TicketTRAX for American Express, which refunded more than $2.5 million in lost electronic tickets to clients. Following that project, he served in executive leadership roles including Vice President of Total Systems Services (TSYS) and President of Prepaid Resources. He led several cross-functional teams responsible for card platform functionality and management, and new prepaid card products and processing component development. His clients included: Walmart, RushCard, MoneyGram and Green Dot. With nearly 4 decades of experience at large fintech corporations, Duane is leveraging all available resources and assembling the pieces needed for a successful launch of our blockchain network and StreamIoT™ platform and portal. To align with our new company direction, we have developed a structured communication plan with the goal to be more informative and timely. Content will be released in regular, bi-weekly updates on our Website and Social Media. We appreciate your continued support as we roll out this plan in the coming weeks. Please send your questions, feedback, or ideas on our new approach to contact@blocksafe.co. In our next update we will be diving into the latest additions to the Blocksafe® development team, showcasing their previous projects and what role they serve.